Histones are highly conserved proteins that serve the core of nucleosomes, which serve to organize chromatin fiber for DNA packing. 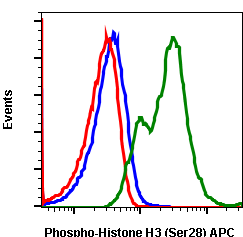 Histone H3 phosphorylation plays a major role in both transcriptional activation, which requires unpacking of the chromatin structure, and in chromosome packing during cell division. 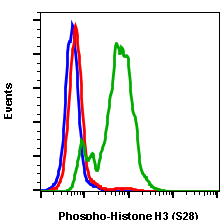 Histone H3 is phosphorylated at residues Ser10 and Ser28, and is acetylated at Lys14. 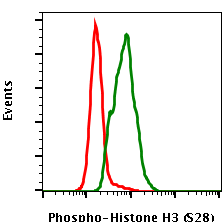 Phosphorylation at Ser10 occurs during entry into mitosis prior to chromatin condensation, and phosphorylation at Ser28 follows a similar pattern. 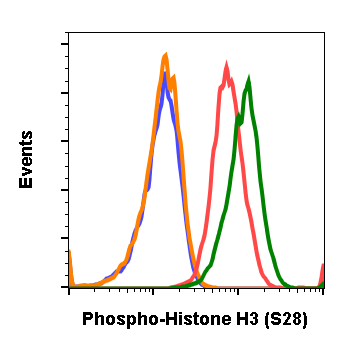 In response to EGF stimulation, it has been proposed that sequential Ser10 phosphorylation, then Lys14 acetylation occurs, causing a change in chromatin structure and gene activation. 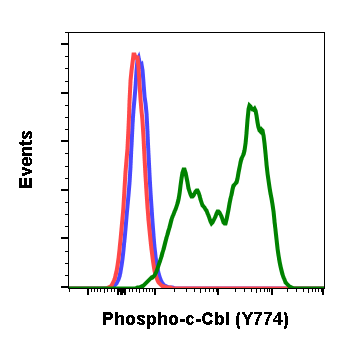 Hans F and Dimitrov S. (2001) Oncogene. 20: 3021-3027. Cheung P, Tanner KG, Cheung WL, et al. (2000) Molecular Cell. 5: 905-915. 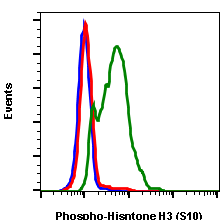 Flow cytometric analysis of Hela secondary antibody only negative control (blue) or untreated (red) or treated with nocodazole (green) using 0.05 µg/mL Phospho-Histone H3 (Ser28) antibody HisH3S28-D6. Cat. #2046. 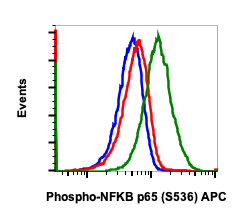 Flow cytometric analysis of NIH3T3 cells secondary antibody only negative control (blue) or 0.1 µg/mL of isotype control Cat. 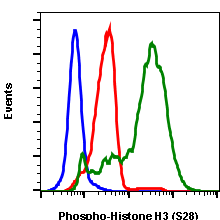 #2141 (orange) or untreated (red) or treated with UV and PMA (green) using Phospho-Histone H3 (Ser28) antibody HisH3S28-D6 at 0.1µg/mL. Cat #2046. 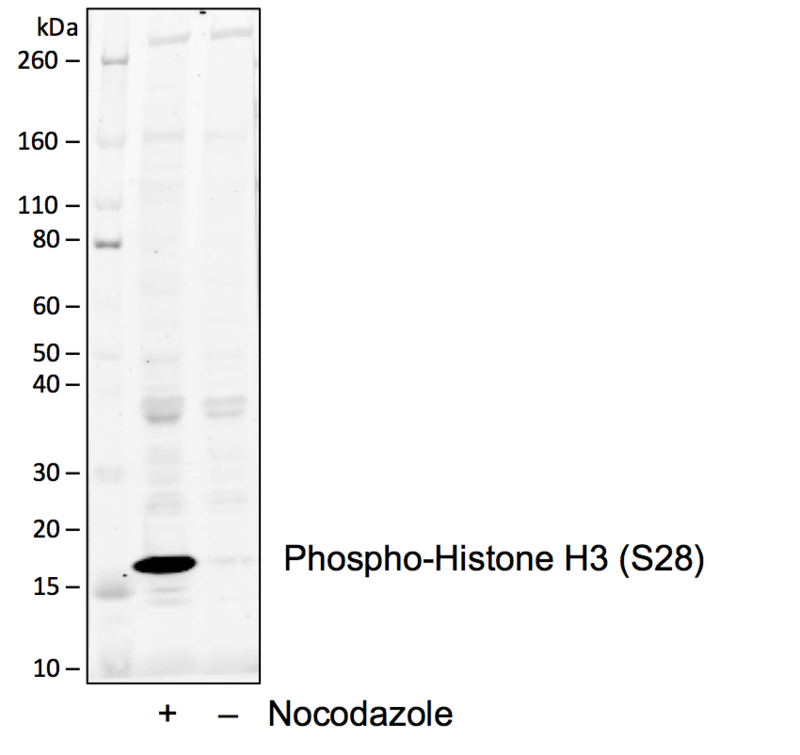 Western blot analysis of Hela cell extract untreated or synchronized in metaphase by treatment with 0.4 ug/mL of nocodazole for 6 hr then metaphase cells were isolated by mitotic shake-off using Phospho-Histone H3 (Ser28) antibody at 1 ng/mL HisH3S28-D6. Cat. #2046. 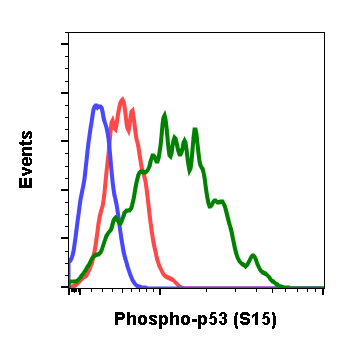 Flow cytometric analysis of HeLa cells secondary antibody only negative control (blue) or untreated (red) or treated with nocodazole (green) using Phospho-Histone H3 (Ser28) antibody HisH3S28-D6 (Abwiz Cat. 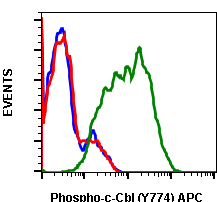 #2046) at 0.05ug/mL or Company C antibody at 0.2ug/mL (manufacturer's recommended concentration). 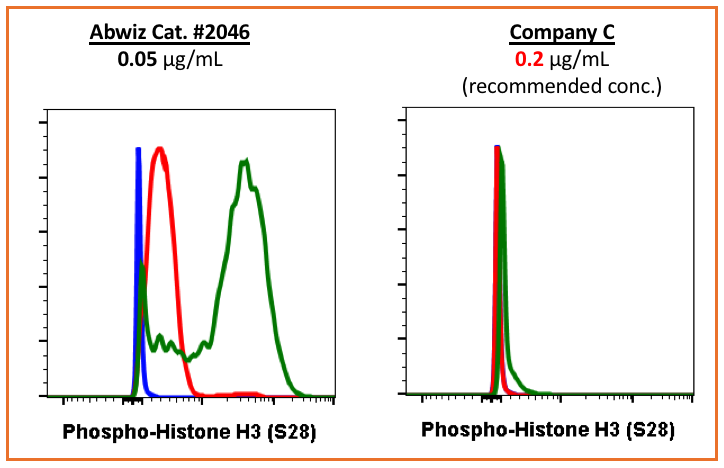 Western blot analysis of HeLa cells untreated or treated with nocodazole (green) using Phospho-Histone H3 (Ser28) antibody HisH3S28-D6 (Abwiz Cat. 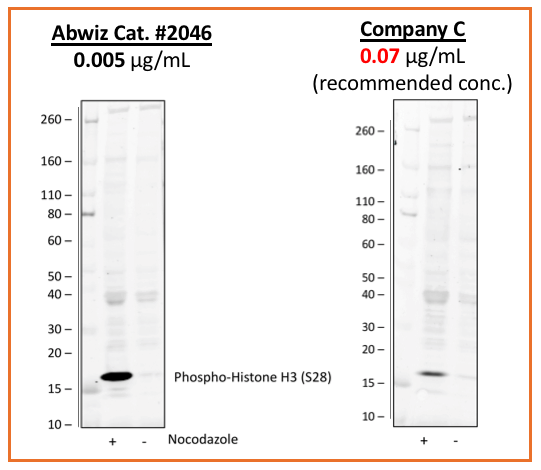 #2046) at 0.005ug/mL or Company C antibody at 0.07ug/mL (manufacturer's recommended concentration) developed using the same exposure.